It was an absolute delight for me this weekend to finally have the opportunity to meet Jonathan Martin, as well as to have him spend some time with us and speak at River City. If you don’t know of him, you should! He is the preacher that I have most deeply connected with over the last year, and I religiously follow him on Twitter, read everything on his blog, and have listened to all of his back sermons from the church he planted in Charlotte. Jonathan brings a unique mixture to his preaching style. He is affable and authentic, quite vulnerable, and naturally funny. He is a deep thinker who wrestles with theology at a multitiered level, yet always remains accessible. What I appreciate most about him though is the way he brings his listeners to the deepest depths of a Biblical text, then gets out of the way and lets each hearer encounter the words of God in a raw and personal way. That is why I have gravitated to his sermons so often over the past year – I can recall nearly a dozen memories of on-the-spot encounters I have had with God as I listened to him explore a text. All of this is why I was excited to have him with us at River City. Our congregation has a real love for Scripture, and resonates well with authentic Bible teachers. This past Sunday’s sermon was vintage Martin (at least in my opinion). The subject matter was quite simple — he focused on one stanza from the Lord’s Prayer: “Give us this day our daily bread.” Yet the simplicity of the prayer did nothing to stand in the way of a deep dive into what it says about us and God. There is something about the human condition that seems incapable of living in the now. We seem unable to enjoy the moment; to be grateful for our current provision; to be joyful in our present reality. We tend to either memorialize the past or anxiously await the future. Jonathan joked that for some of us, we seem to incessantly gravitate back to the “glory years.” This is quite common in the life of church. As the congregation grows and evolves, some of us are tempted to say, “I wish we could go back to (fill in the blank) era. Things were so peaceful then. Everybody knew each other. There was so much harmony and joy.” Of course, the actual reality was almost never as good as the fantasy we have turned the glory years into. But that’s just the point – by fondly remembering a story we’ve created for ourselves, we find another way to escape from the reality we currently live in. For others of us, we spend all of our precious emotional resources on trying to guess what lies ahead. We worry about our future finances, our future vocation, our future spouse, or the future of our kids. We plan, strategize, and obsess over every potential detail. We hear the words of Jesus — “Can any one of you by worrying add a single hour to your life?” — but it doesn’t seem to break the anxiety cycle. When it comes down to our emotional and spiritual state, we realistically live much more in the future than in the present moment. Jonathan took the simplest of words and turned it into a powerful preaching tool. 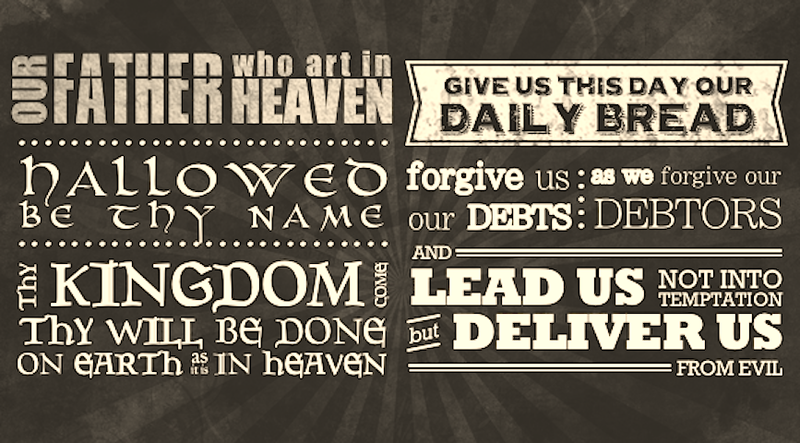 The only way we really break the cycle of being trapped in either the glory years or future anxiety is to allow the words of the Lord’s prayer to sink all the way in. When we pray “Give us this day our daily bread,” he reminded us that the most important word might be THIS. We are designed to be dependent creatures. Like the Israelites who received daily manna, God has designed us to be dependent on him in a day-by-day, moment-by-moment way. We don’t have leftover manna to live off of from the glory years. And we don’t get a detailed plan of where next year’s manna comes from. All God promises us is THIS day, and THIS bread. What if we learned to receive that as a gift instead of a curse? What if each meal could be received with a grace for THIS moment’s provision. What if each good conversation could be received as a gift from God for THIS moment? On and on the list could go. I have carried this challenge and prayer with me since Sunday. I am asking God to reveal to me THIS — this moment, this grace, this provision, this gift, this opportunity. It really does change the way you look at each day day… even each moment with God. For this, and this—only this. I do not ask for then. I do not ask for there. I do not ask for that. Daniel, thank you SO much for sharing this! I’ve been having trouble with my blood pressure, and somehow I’ve been suspecting that part of it is that I am not living in the Lord’s present tense…I’ve blogged on it and prayed it. I’m learning and growing in living in His I Am. But this post gave me more encouragement and help along the way. I love the word “THIS” and will be ruminating on it everyday! May I share it and link back to this blog post? Many blessings, dear brother! The Lord is encouraging His people through you and your sharing! Thank you so much for your kind words Jan – you are such an encourager! You are always welcome to share whatever you’d like! Blessings on your writing ministry, and I hope that your blood pressure returns to normal!